Community Forestry | Keep Indianapolis Beautiful, Inc. Sometimes, keeping our city beautiful is as simple as planting a tree. Trees enhance our lives in more ways than you might think. KIB coordinates a number of programs dedicated to planting, preserving, and educating people about trees. Our goal is to increase Marion County's tree cover by planting 100,000 large trees-with trunks 1" in diameter or larger at planting time-in strategic locations. Together we can grow our city's tree canopy and make Indianapolis a better place to live, work, and play. More than just good looks, the trees we plant support life. They make a healthier, cleaner, and greener home for people and nature. Our Community Forestry program gives you the opportunity to plant and care for trees in your neighborhood. We hope to plant with you soon! Follow our recommended steps below to gather all the information you need for a successful planting. TAKE A WALK: Walk around your neighborhood or your block. Notice spaces throughout your community that would benefit from trees. Are there at least 20 spots for trees? Thumbs up. Note: This community tree planting must be located in Marion County. MEET YOUR NEIGHBORS: Share your interest in and plans for planting trees. Ask your neighbors what they think about trees. This is very important! We're here to help! Let us know your interest in organizing a neighborhood tree planting. Contact Mari Aviles, Community Arborist, at maviles@kibi.org. Supportive neighbors are key to a successful tree planting. Form a small group that will help you begin to organize the planting. We have "Free Trees Coming Soon" door hangers for you to spread the word. Remember to share that you, your neighbors, and nearby business owners need to commit to tree preservation. Each tree needs 15 gallons of water every week from late March through November for the first three years. Growing our tree canopy doesn't stop with planting the tree! Follow up with neighbors who want to be involved. Invite them to participate by spreading the word, volunteering on planting day, or caring for a planted tree. Compile a list of addresses where trees will be planted. You will need to include this in your Community Forestry application. Fill out your tree application online or print it out and mail/bring it to our office at 1029 Fletcher Avenue, Suite 100. Applications for 2020 tree plantings must be submitted by July 7, 2019. In early September, we'll let you know if we can fulfill your request. Seem like a lot? We're here to help. Our Community Forestry and Community Engagement teams can help you through the process. Contact Mari Aviles, Community Arborist, at maviles@kibi.org. We're in this together. Adding trees to Indianapolis takes neighbors like you working alongside our trained community arborists. Here's a breakdown of what we need from you-and what KIB promises in return. Gather volunteers to help plant trees. Encourage your neighbors to be a part of the process. Water the trees for three years. Once the trees are planted, you and your neighbors will be responsible for watering each tree with 15 gallons of water each week, spring through fall, for the first three years. Help us create more tree lovers! Share your awesome experience with KIB with friends, family, and coworkers and help us speak for the trees. We'll take care of watering, mulching, and pruning trees planted in the public right-of-way (that strip of grass between the sidewalk and the street) for three years after the tree is planted. In fact, we hire a 100-person Youth Tree Team every summer to make sure our trees are taken care of! Every three years, we'll prune trees. After five years, the trees should be well established and survive on rain water alone. During hot weather streaks, it never hurts give trees planted near you some extra watering. Note: KIB waters trees in the public right-of-way (that strip of grass between your sidewalk and the street). We do not water trees in common areas, schools, churches, or homeowners' association neighborhoods. Research has shown that watering trees together builds community, and we want people to take collective responsibility for their trees. How to plant a containerized tree. How to plant a ball burlap tree. NOT READY FOR TREES IN YOUR NEIGHBORHOOD?
. . . but you still want to get involved? Great! Volunteer at a Tree Planting. With an overall goal of planting 100,000 trees in Marion County, we can use all the help we can get. Register Your Trees. Did you recently plant a tree? Help count toward our 100,000-tree goal by registering it today. Donate online. Turn your green into green. Purchase a Legacy Tree. Looking for the perfect gift for someone special or a unique way to honor someone? Engage your company in our work. Spend a day out of the office with a custom day of service. Click to explore Indianapolis' tree cover! 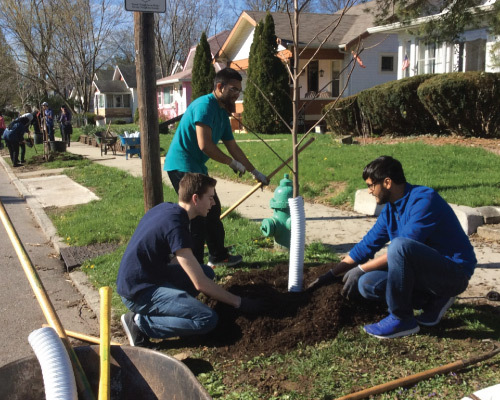 Citizens Energy Group, Keep Indianapolis Beautiful, and the Indianapolis Department of Public Works have joined forces in a long-term partnership to plant 10,000 trees across the city to beautify neighborhoods and reduce combined sewer overflows (CSOs) to area waterways. KIB is excited to support CEG's investments that will nearly eliminate CSOs to area rivers and streams by the year 2025. Indianapolis' original sewer system was designed to carry only stormwater away from streets, homes, and businesses. When indoor plumbing allowed bathrooms to move indoors, sewage lines were hooked to these same sewers, combining stormwater and sewage in one pipe. These "combined sewers" were state of the art at the time. 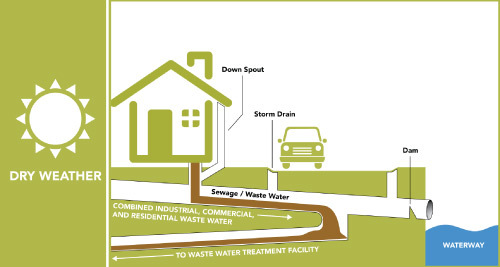 Today, CEG builds separate sewers for stormwater and sewage. However, combined sewers remain in many of the city’s older neighborhoods. When we get ¼ inch of rain or more, the combined system can cause raw sewage to overflow into our streams and rivers, causing a threat to public health. In the central part of Indianapolis, even a light rainstorm can cause raw sewage to overflow and pollute Indianapolis waterways. Raw sewage overflows are a major cause of pollution during wet weather in portions of the White River, Fall Creek, Eagle Creek, Pleasant Run, Bean Creek, Pogue's Run, Lick Creek, and State Ditch. How do trees reduce the amount of stormwater entering sewers? 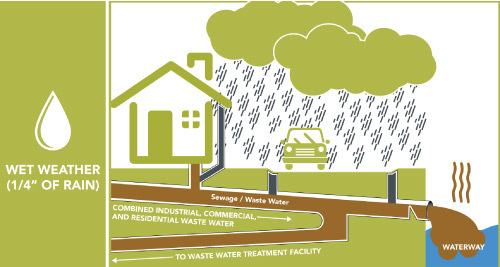 One large tree can keep thousands of gallons of stormwater out of the sewers every year! Trees hold precipitation on their leaves, branches, and trunk. Capturing rainwater cuts the amount of water our sewers have to handle, reducing raw sewage overflows into our streams. Do trees have other benefits beyond intercepting stormwater? How are CSO basins identified for tree planting? CSO basins are drainage areas—land where water collects and flows into a common river or stream—that contain the old-fashioned combined sewers. KIB and CEG mapped Indianapolis to find where CSO basins overlap with areas that have little tree cover, plenty of plantable space, and high impervious surface area (generally paved places, such as parking lots, that water must flow over instead of soaking into the ground). Where will trees be planted within the selected CSO basins? KIB will identify tree planting locations within the city right-of-way along streets and in Indy parks. KIB arborists take into account tree growth; survival factors; and distance from power lines, traffic control signs, street lights, and existing trees. For street trees, KIB identifies tree lawns (the strip of grass between the street and sidewalk) large enough to accommodate large trees. How large are the trees at the time of planting? New trees are typically about as tall as a person and 1 - 2" thick near the base of the trunk. Some species are as big as 12 feet tall when planted. What species of trees will be planted? KIB will plant a variety of tree species. A pest or disease usually targets specific types of trees, such as ash trees. Planting more species makes the overall urban forest be less vulnerable to pests, diseases, and other threats, because only certain trees will be at risk at any one time. KIB will primarily plant tree species native to Indiana and contiguous states. Trees species that have been growing in this area for thousands of years are adapted to our local climate and soil conditions. Native tree species also support more butterflies and moths, which are an important part of our food web. KIB will plant large-growing species. Larger trees can intercept significantly more stormwater than smaller trees. 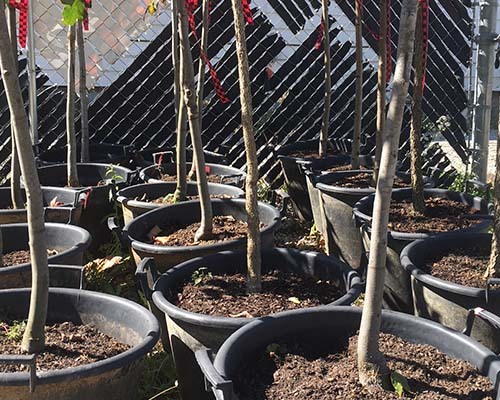 Since the goal of the 10,000 Trees initiative is to reduce peak stormwater flows, only large-growing species (like oak trees) will be planted. When will trees be planted? We plant in the spring (March, April, early May) or in the fall (October, November, December). How will I know if I am getting a street tree in front of my house? Be on the lookout for KIB staff leaving door hangers, flagging possible tree spots, adding white marking lines, or putting up yard signs on the ends of blocks to let you know that trees are coming. Attend your neighborhood association meetings to learn more! KIB staff will lead volunteers in tree planting. Residents are welcome to volunteer to plant trees. Sign up to volunteer at kibi.org/projects. We will . . . but we'd love your help! KIB will water, mulch, and structurally prune the trees for three years. "This pruning improves the tree's structure, making limbs less likely to break as the tree ages." The City of Indianapolis will continue to maintain right-of-way trees in the long term. You can help the trees survive by keeping mowers and string trimmers away from tree trunks to prevent damage. Myth: "Trees break sewer lines." Trees are not physically capable of breaking a sewer pipe. Tree roots can get into a sewer pipe only if it is already broken and leaking sewage into the soil. Many older homes have underground sewer lines made of clay tile pipes. These pipes are made of many short sections of ceramic pipe that are fitted together. This pipe design, with its many short sections, is prone to leaking at the joints. Modern sewer lines are made of PVC and other materials that come in much longer lengths and can be connected to each other with much stronger bonds. Homeowners are responsible for keeping the sewer pipe on their property (their sewer lateral) in working condition. Many plumbing companies offer video scoping of your sewer pipe free of charge. You can be proactive and have your sewer lateral scoped periodically, which allows you to catch any leaks before tree roots and other obstructions begin getting into your sewer line. If your sewer line needs to be replaced, techniques such as "pipe bursting" allow sewer lines to be replaced without digging a trench for the entire length of the pipe. Just like any other physical structure, sidewalks have an average life expectancy. Some sources place the life expectancy of a concrete sidewalk in the Midwest at 30 years. The average life expectancy for people in the United States is about 78 years. If you lived near the same sidewalk your entire life, even with no trees nearby, you could expect that sidewalk to be replaced at least twice in your lifetime. Some sidewalks heave and crack without any trees nearby and end up needing to be replaced in less than 30 years. With that understanding, some sidewalk heaving is associated with tree roots; however, the way in which it happens is interesting. Like many materials, concrete expands when warmed and contracts when cooled. In the cooler months of the year, sidewalks contract, which can open up some space underneath the sidewalk. Sometimes tree roots grow into these new, open spaces under contracted sidewalks. In the warmer months, when the sidewalk expands again, newly grown roots may prevent the sidewalk from expanding into its former space. The result can be the sidewalk heaving or cracking. Suggested reading for anything and everything you need to know about trees. Dirr, Michael A. Manual of Woody Landscape Plants: Their Identification, Ornamental Characteristics, Culture, Propagation and Uses. Champaign: Stipes Publishing, 1975. Hightshoe, Gary L. Native Trees, Shrubs, and Vines for Urban and Rural America. Toronto: John Wiley & Sons, Inc. 1988. Jackson, Marion T. 101 Trees of Indiana. Bloomington: Indiana University Press, 2003. Johnson, Warren T. and Howard H. Lyon. Insects That Feed On Trees And Shrubs. Ithaca: Cornell University Press, 1991. Sinclair, Wayne A. and Howard H. Lyon. Diseases of Trees and Shrubs. Ithaca: Cornell University Press, 2005. Tallamy, Douglas W. Bringing Nature Home: How You Can Sustain Wildlife with Native Plants. Portland, Oregon: Timber Press, 2007. Weeks, Sally S., Harmon P. Weeks, Jr. and George R. Parker. Native Trees of the Midwest: Identification, Wildlife Values, and Landscaping Use. West Lafayette: Purdue University Press, 2005.